is it possible to graph this value? how can i set a notification if this value goes up to -70dBm? The customer followed-up via E-mail. I will share the "solution setup" in case anyone else faces the same situation. As pointed out by the previous reply, before being able to "evaluate" the value (from this string) one needs to extract the numerical value, for instance with a regex expression. With this configuration, the sensor will go into Warning if the value goes below -55. For Notifications (as well as alerts) please add a new State Trigger for the corresponding state (Warning) to the sensor (in the Notifications tab). 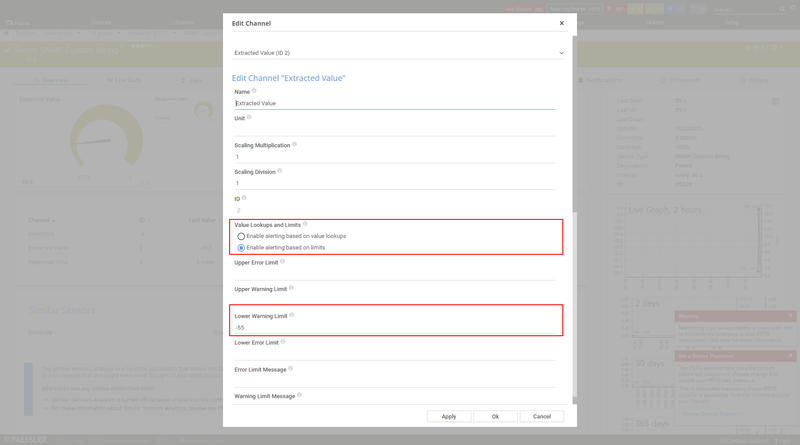 As for #2, as soon as the numerical value shows up in a Sensor Channel, you will be able to configure limits, alerts and everything else. I have referred to "Can i graph text values? ", but it doesn't look like we can graph it. Will you be able to receive a screenshot if i send it to suuport@paessler.com? It will probably make more sense when you see the screenshots. I am not sure if i can upload the screenshot on this KB.